Forge ahead without spills on your way to the trailhead in the morning. 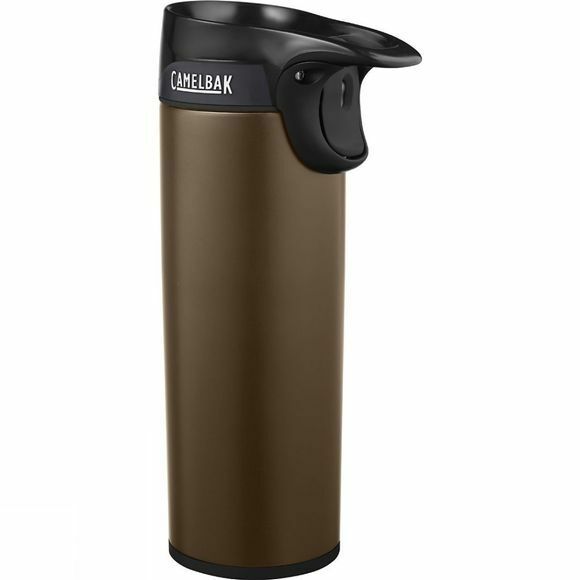 Sometimes water just isn't enough–that's why CamelBak have reinvented the travel mug for a better on-the-go coffee and tea experience. The double-walled, vacuum-insulated steel vessel keeps coffee or tea piping hot for up to six hours, with an impact cap that prevents dents or cracks if you drop it. The Forge Vacuum Insulated Bottle 500ml is designed to fit in most cup holders, but the leak-proof cap means you can also toss it into your pack without soaking your gear. When you need to keep your eyes on the road, the self-sealing cap lets you drink one-handed, then snaps back into place to prevent leaks or spills. For frequent sipping, just press the top button to lock the cap open. The lid won't collect grime, either–just pop up the arms for easy cleaning in the sink or dishwasher.